I have been coming here to these gardens for a number of years. When I lived closer to the city we would ride our bikes in to the Botanical gardens and stop for Devonshire tea at the garden cafe. This time, with my friends visiting, we took the bus to Southbank where we hopped on to a city cat to go across the Brisbane river to these lovely gardens, arriving via QUT. The City Botanic Gardens, which is Brisbane Citys oldest park, was originally planted by convicts in 1825 with food crops to feed the prison colony. These gardens include ancient trees, rainforest glades and exotic species. They run the full length of Alice Street, bordered by Parliament House on the one side and the Brisbane River’s northern banks on the other. 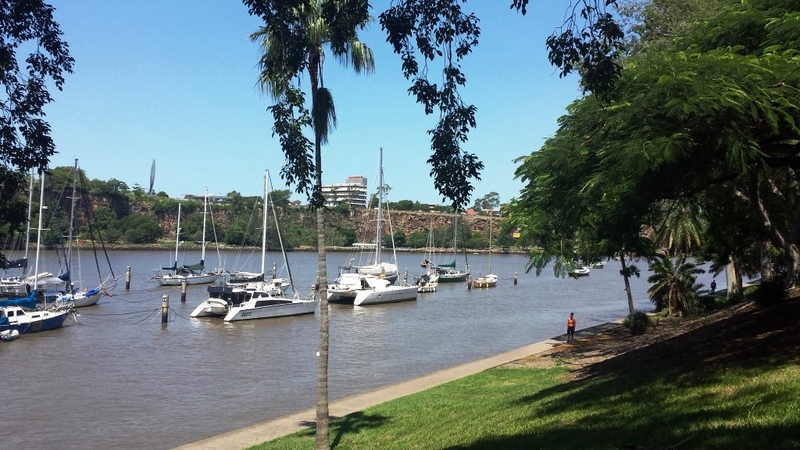 Where the park borders the Brisbane river there is a wide tree lined path, which offers a pleasant walk by day or evening, and from here there are views of the many yachts at anchor and in the distance the iconic Story Bridge. In the park there is so much space that even when the park is busy you don’t feel overcrowded. There are many walkways which are wide enough to allow for both bicycle and foot traffic to share. The gardens are an absolutely wonderful display of the most beautiful delights anyone could wish for. A large expansive area is set out beautifully with lots of grassy areas to relax in. The flower displays are truly delightful. The gardens are beautifully maintained and you really can get amongst the shrubs and giant trees. There are several large camphor laurel trees which are fantastic for climbing. The pond serves as a brilliant focal point that is teaming with wildlife including many species of birds, lizards (water dragons) and turtles. There are several options of cafes to stop for coffee or lunch. We chose to have lunch in The Pantry located at QUT at Gardens point and within the grounds of the Iconic Old Government House. This small cafe offers a great selection of simple morning tea and lunch items, wonderful coffee and an interesting atmosphere. There are free guided walks available from Monday to Saturdays from approximately 11.00 a.m. to 1.00 p.m. (excluding public holidays). These walks which last approximately one hour are led by experienced, friendly Volunteer Guides. Just meet at the Rotunda near the Alice Street Main Entrance. This is a brilliant place to visit with the family. You can wander through the gardens or walk along the river bank all the way to the bridge over to Southbank. After over 20 years of living in Brisbane I thought it was time that I learned some more about my city. Although I have been in to the city many times I have never actually taken the time to explore it. So, I booked a tour with Brisbane Greeters. It was by accident that I recently learnt of this wonderful program here in Brisbane. I contacted them and organized to do a walking tour of Brisbane precinct. I met with my guide Bruce, at King George Square outside Brisbane city hall. I was excited to do this tour however I was not prepared for how good it was. Lucky me, I was the only “tourist” for this guided tour of our city. We started our tour in the square discussing Bruce’s plans for the tour. He made some suggestions and then with my input he customised the tour to fully suit me. Bruce gave me a brief overview of the history of Brisbane before we headed off. We started our tour in the City Hall. City Hall is considered to be one of Brisbane’s finest buildings. The building has been used for royal receptions, pageants, orchestral concerts, civic greetings, flower shows, school graduations and political meetings. City Hall does offer its own guided tours of this lovely building so my visit with Bruce was certainly enough to whet my appetite to return one day for a tour. In the meantime, from Bruce, I learned that the white marble staircase in the entrance is made using marble from Carrara in Italy, the bell tower was inspired by St Mark’s in Venice and the dome was inspired by the Pantheon in Rome. From the city hall we walked over to the Brisbane Arcade which is a heritage listed shopping arcade and was built in 1923. Definitely one of if not the nicest shopping arcade in Brisbane consisting of beautifully designed shops offering high-end jewellery, clothing, antiques and much more. Our tour continued up Queen St to North Quay to the heritage listed Treasury building, which now houses Brisbane’s Casino. 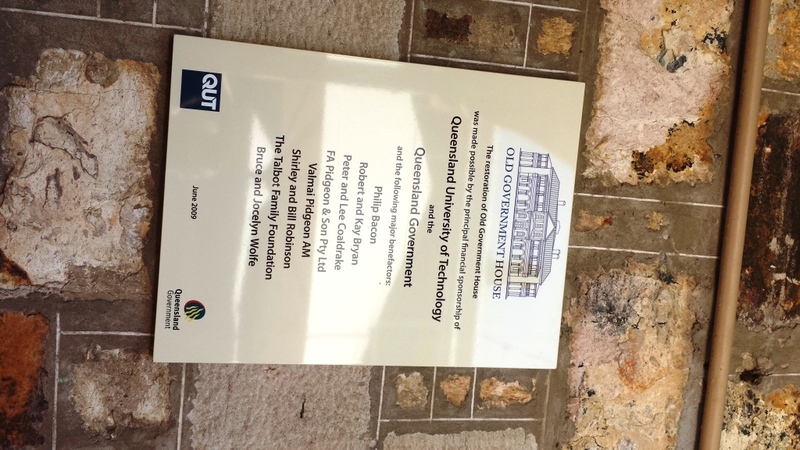 The tour included many of Brisbane’s original buildings – the commissary which is home to the Royal Historical Society of Brisbane, and Old Government house which is located on the grounds of Queensland University of Technology at Gardens Point. The QUT campus is home to public arts venues, museums, top fitness facilities, and our state-of-the-art Science and Engineering Centre. We stopped at the Pantry café on campus for our well-earned lunch and coffee. After our small rest we headed off through the botanical gardens which is on the river and which Qut is attached to. We had many stops along the way to our destination of St Stephens Cathedral the heritage listed cathedral church of the Roman Catholic Archdiocese of the city of Brisbane. I learned from Bruce that part of the stone used in the construction of this magnificent building was taken from Kangaroo point just across the river. Bruce’s wealth of information was fantastic. He is very passionate about Brisbane and was so informative the entire time. I have been on many walking tours around the world but this would definitely be the best guided walking tour I have ever done, and, it was free. Bruce informed me that there are many cities around the world offering this personalized free service. I later googled Greeters Organisation and discovered there are in excess of 90 cities world-wide offering this fabulous service including several cities in Italy. Toowoomba (nicknamed ‘The Garden City’) is a city in the Darling Downs region of Queensland, Australia, located 127 km (79 mi) west of Queensland’s capital city, Brisbane. Toowoomba is situated on the crest of the Great Dividing Range around 700 metres (2,300 ft) above sea level. A university and cathedral city, Toowoomba hosts the Australian Carnival of Flowers each September. 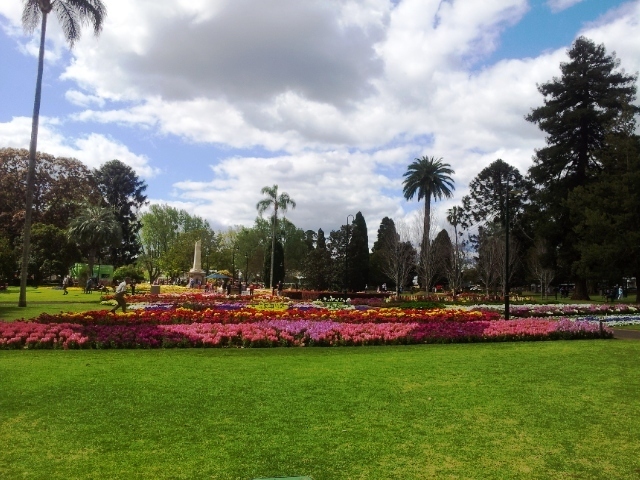 With hundreds of parks & blossoming gardens to explore, the Toowoomba Carnival of Flowers has something for everyone. Yes, this is not Italy but this was such a lovely excursion and the gardens are just so beautiful I wanted to write about it. It took us about an hour and 45 minutes to drive up to Toowoomba. Toowoomba has a different climate to Brisbane, it is not as humid, consequently the flowers, shrubs and trees, in my opinion are just so much nicer. The abundance of colour and the spectacular variety of flowers reminds me of many of the lovely gardens in Italy. This annual garden festival includes prize-winning private gardens, and many public parks. We started our visit at the Picnic Point which is located on the escarpment of the Great Dividing Range. Picnic Point has panoramic views to the horizon. There is a great restaurant there, plenty of picnic areas and actually you could spend a full day there. We then drove over to the University where we spent time in the Japanese Gardens. These are probably one of the nicest if not the nicest Japanese gardens in Australia. After the Japanese gardens we drove over to Laurel Bank Park which presents a splendid display of beautiful blooms, exotic scented gardens, herbs and shrubs in raised garden beds. Here we had a very Aussie lunch which was put on by the local Lions Club. I am always happy to support these type of charity clubs. Our last stop before heading back to Brisbane was Queens Park Gardens which is within walking distance of the city heart and features Toowoomba’s Botanical Gardens, bright flower beds, avenues of large leafy trees, wide open grasslands, an off leash area for dogs and two well-equipped children’s playgrounds. Queens Park is also home to the Ergon Energy Flower, Food and Wine Festival, and lots more. After a lovely day visiting these gorgeous gardens and feeling very content we then headed back to Brisbane.